On July 29th one of my best friends from college, Sabah, is getting married in Sofia, Bulgaria! I was honored when she asked me to be her Maid of Honor, but was so nervous about making sure everything was perfect leading up to the big day. So, we all know what that means, making sure the Bachelorette Party was top notch, & everything she wanted and more. Sabah decided she wanted the weekend in Charlottesville, VA, which is our nearest wine country, so the co-MOH, Cat, & I went to work immediately planning the June weekend. This was my first time planning a Bachelorette party, but I’ve been told I’m decent at party planning, so I knew I could pull this off and make it the best weekend ever for her. 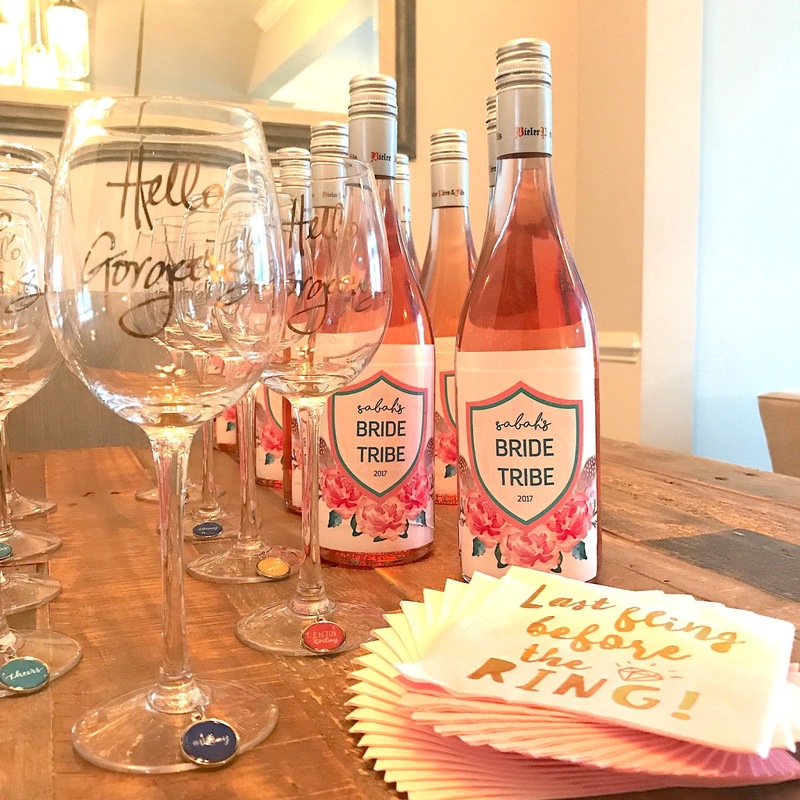 While going through everything, and trying to plan out all the details, I came up with 5 tips I think are helpful for anyone planning, or helping to plan, a Bachelorette party. We couldn’t have asked for a better weekend and I’m so happy Sabah, and the rest of the girls, loved everything! Everyone loves being part of a wedding, but the truth is that it can get expensive. 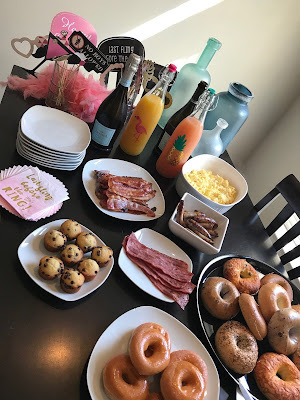 For a Bachelorette party, or weekend, not only do you need to pay for the party festivities once you’re there, but some people may need to fly or take a train to wherever it is your going, and that can get expensive!! In order to make this weekend a financially stress free time, I wanted to make it all-inclusive, and have people pay as little as possible for things once we were there. So, to do this, I included the price of the Airbnb, all food and alcohol for the house through the weekend, 3 winery tastings & private bus to vineyards, goodie bag/ decorations, and an array of appetizers when we went out to dinner, in the price the ladies paid. & can you believe, the total came to a little less than $500 for each girl. Breakfast at home is much better than spending $$ to go out! I’ve heard of some people dropping $1,000+ for a Bachelorette Party, and I know that can be a huge financial burden, it’s important to avoid that at all costs. Now, I know that the location of where we were (not Vegas or Miami) contributed to the smaller cost, but honestly, Charlottesville isn’t a cheap area. I made sure to stick with my budget and constantly explore other options until I found what I wanted for the cheapest price. Etsy is the most popular website for Bachelorette and wedding everything, and understandably so. However, it’s not always the cheapest option, & I think people underestimate just how easy it is to find what you want for much cheaper prices, especially when it comes to decorations. I was able to find the very same banners I favorited on Etsy, on Amazon and Ebay for significantly lower prices. 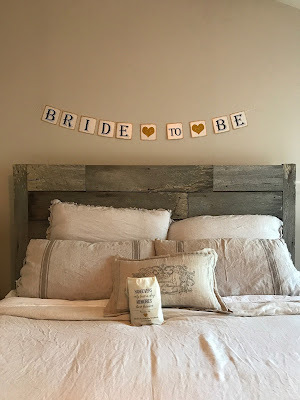 Proof: I found the Bride to Be banner below on Amazon for $8, Prime, and the very same banner was $20 on Etsy, plus shipping. I saved all of the personalized items for Etsy, but other decor I made sure to search high and low for the best price. Ebay was great to search since people sometimes sell the banners they already used for a party, for half the original price. I also hit big with Pier 1, those Hello Gorgeous wine glasses were on clearance for $3 each…seriously…$3 each. Since they weren’t personalized glasses I bought wine charms from Target that were, you guessed it, on sale, so we could tell our wine glasses apart. When it came to the personalized goodies, I made sure to search through multiple sellers and looked for high quality, low cost items. 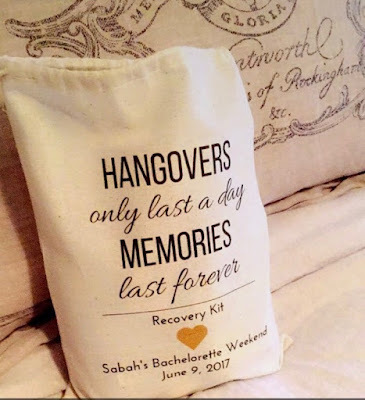 I ordered Hangover Survival Kits for the girls, and purchased the bags from the AlfandNoop Etsy store…$18.50 for ten bags was a great buy. The best price for customized hair ties I found was through the LittleChiefFavors shop, $2.50 each. Inside the Recovery Kits: Bottle of water, hair ties, Burts Bees Lip Balm, Advil packet, Neutrogena face wipes, Hershey Kisses, & Life Saver Mints. Most of what was in the bag was purchased from Walmart, where I was able to buy in bulk online, and save a lot of $$$. Hotels are lovely and fun, but in order to cut costs, stay in an Airbnb! We stayed in this gorgeous home, about 15 minutes from downtown Charlottesville. I would advise it to anyone and everyone looking to stay in that area. 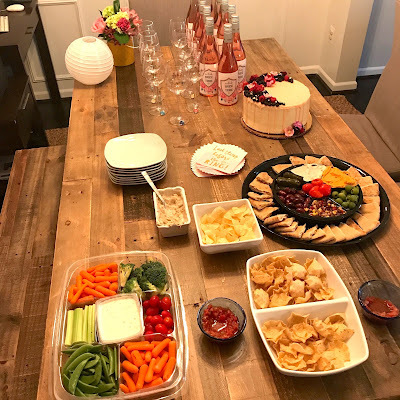 The hosts could not have been more awesome, they left a gift for the bride to be, an arrangement of snacks, Champagne, and breakfast foods. Not every Airbnb has hosts that pay attention to detail like this, we seriously lucked out. But, every Airbnb will help you cut costs on food and drink, which you’d, for the most part, have to purchase out when staying at a hotel. I was able to do grocery shopping for the weekend online through Harris Teeter, used a ton of coupons, and then picked it up before arriving at the house. We were in Charlottesville for a Friday and Saturday night- I planned a dinner out in town on Friday, and since we were doing a vineyard tour all day Saturday, I had Saturday dinner catered by Wegmans. Seriously, Wegmans catering is delicious, and well worth the price. I also ordered some appetizer trays, and a fruit platter for breakfast through Wegmans- the presentation was beautiful and it fit the budget. Staying in a home, or apartment, with a full kitchen is definitely helpful and not only gives the weekend a more cozy and personal touch, but allows you more freedom to just relax and snack & drink when you want. 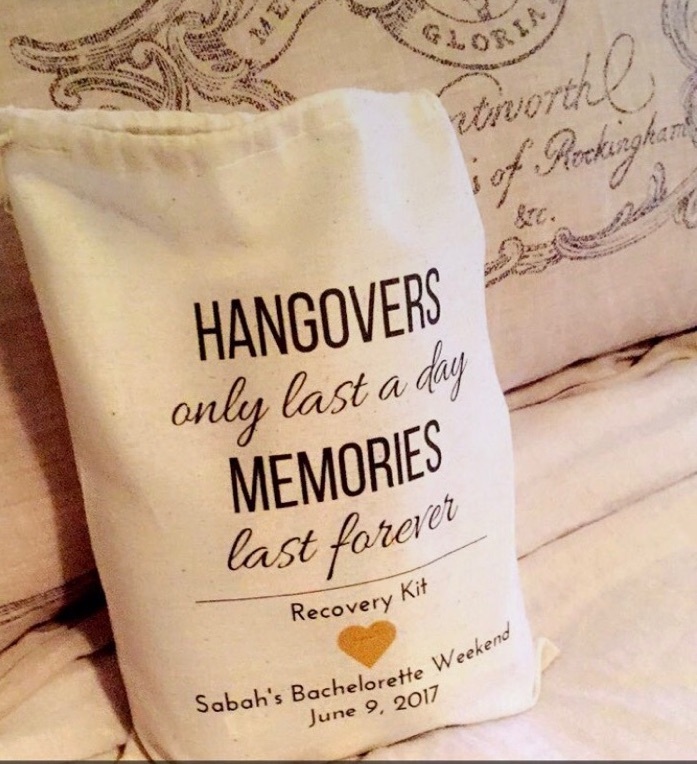 As I’ve mentioned quite a few times in this post, we know shelling out $$ for a Bachelorette weekend, or night, can be a lot. One aspect that can be easily overlooked is getting the bride to be some sort of gift to open up with her friends. A night or weekend like this will, hopefully, never happen again for the BTB, so it’s important her girls pull out all the stops. A big go to gift is always lingerie, but you don’t need to buy lingerie, or even something more than $20. It’s the thought that counts, and even if you’re traveling far to the event, a chic lipstick that the BTB can wear for her man is something nice and thoughtful to open up. 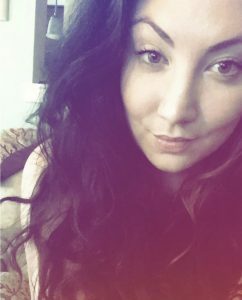 & after you open up some gifts, play a game or two, it’s fun, and if you’ve been drinking it’s hilarious and allows for some true girl time. 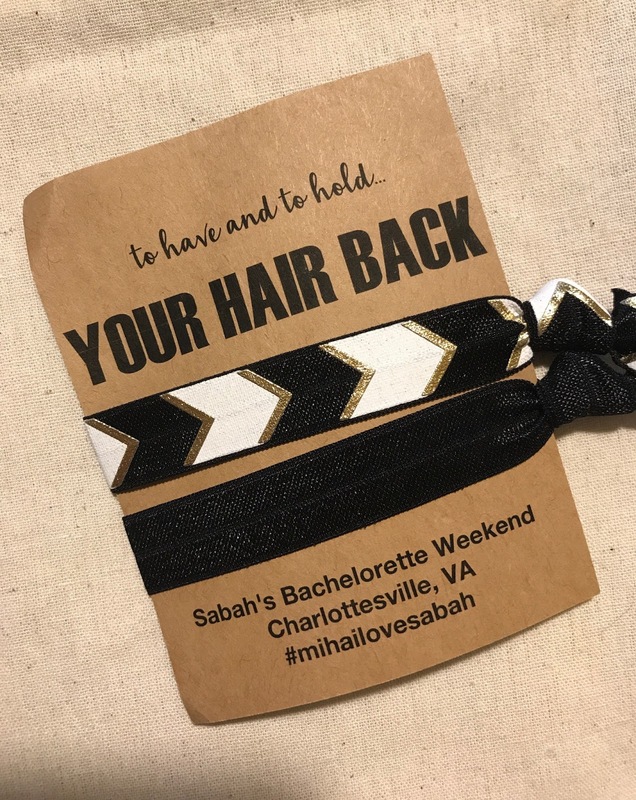 I was so nervous about having Sabah’s Bachelorette Weekend be absolutely perfect. She’s my first bestie getting married, I’m the Maid of Honor, & there were a lot of factors in play that made me want to make this the best weekend for her ever. Well, I guess second best, after her soon to be wedding weekend in Bulgaria of course. Everything went off without a hitch because a lot of planning was put into it, but also because we just chilled out and let it all flow…and it came together perfectly. Worrying about when someone drops out of the weekend or if you’ll have enough money to get one more thing, is pointless. The main point is being with your girls and celebrating a friend who is about to embark on a crazy journey of marriage. Sabah’s Bachelorette Weekend landed a bunch of us with new piercings and tattoos, that definitely was not on the schedule, and it totally pushed back the nice at home sit down dinner I had planned in the agenda…but who cares…it was so worth it. At the end of the day, it’s all about the ladies you’re with, and for this weekend it was a group of spectacular young women. & the most important part…Sabah was as happy as baby goat the whole time. Which for her, equates to being happy as a clam. SUCH great tips to throw a special bach for the bride to be!